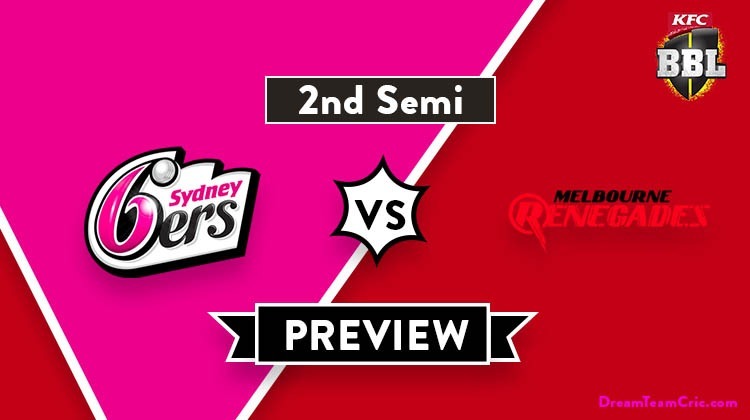 Hello and Welcome to our preview for Sydney Sixers vs Melbourne Renegades match. 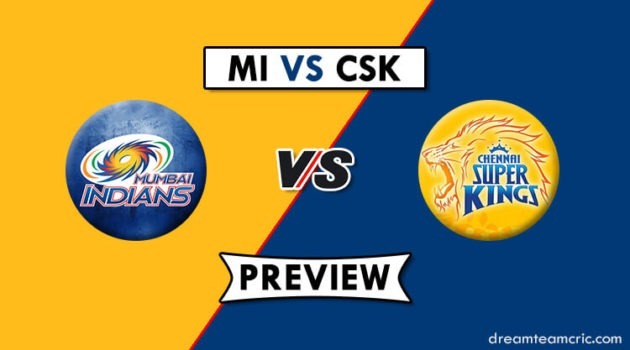 We are covering SDS vs MLR Dream 11 Team Prediction, Preview and Probable Playing XI for the Big Bash League 2018-19 match. The match is to be played at Docklands Stadium. Sydney Sixers ended third on the points table with eight wins and six losses. However, They lost their last match to Melbourne Stars by 94 runs. Bowling first, They restricted Melbourne Stars at 168 with Tom Curran being top performer taking two scalps. Chasing the target, Batsmen failed miserably and collapsed on 74 runs. They will hope for a unison effort from players tomorrow to qualify to the finale of BBL’18-19. Melbourne Renegades ended second on the points table with eight wins and six losses. They also lost their last match to Hobart Hurricanes by 16 runs. Bowling first, They failed to restrict Hurricanes leading to a target of 183 runs. K Richardson and H Gurney took two scalps each for the team. With the bat, Tom Cooper and Aaron Finch played good knocks but were left behind by 16 runs. They will hope to put their best effort into tomorrow’s do-or-die encounter. SDS vs MLR, 2nd Semi-Final, Big Bash League 2018-19. Sean Abbott, James Vince, Mickey Edwards, Ben Dwarshuis, Jack Edwards, Moises Henriques (c), Dan Hughes, Steve O’Keefe, Josh Philippe, Jordan Silk, Nathan Lyon, Ben Manenti, Justin Avendano. Tom Cooper, Dan Christian (vc), Jack Wildermuth, C White, Cameron Boyce, Kane Richardson, Sam Harper, Mackenzie Harvey, Jon Holland, Aaron Finch (c), Harry Gurney, Chris Tremain, Marcus Harris. They have declared 13 player squad for the match with two changes. Ben Manenti and Justin Avendano are added to the squad replacing Lloyd Pope and Tom Curran. Tom Curran has left the squad due to international commitments with ECB. Pacer Mickey Edwards can take the place of Tom Curran. Batsmen Jack Edwards or Justin Avendano can also come in the playing XI to strengthen the batting line-up. Josh Philippe and Daniel Hughes will open the innings. James Vince, Moises Henriques and Jordan Silk will follow them. Sean Abbott will play the role of finisher. Sean Abbott and Ben Dwarshuis will lead the pace attack while Steve O’Keefe and Nathan Lyon will be the key spinners. M Henriques can support the pacers. They have also announced 13 men squad for the match with one change. Mohammad Nabi has joined the Afghanistan team and will not play further in BBL’18-19. Cameron White returns to the squad after recovering from injury. Cameron White can come straight in the place of M Nabi. Jack Wildermuth can also get a nod over M Harvey because of his all-round skills in absence of Nabi. Aaron Finch and Marcus Harris will open the innings. Sam Harper, Tom Cooper and Cameron White will follow them. Dan Christian and Cameron Boyce will play the role of allrounders. Kane Richardson, Harry Gurney and C Tremain will be the key pacers along with Dan Christian while C Boyce will lead the spin attack. Josh Philippe (wk), Dan Hughes, James Vince, Moises Henriques (c), Jordan Silk, J Edwards/J Avendano, Sean Abbott, Steve O’Keefe, Ben Dwarshuis, Nathan Lyon, Mickey Edwards. 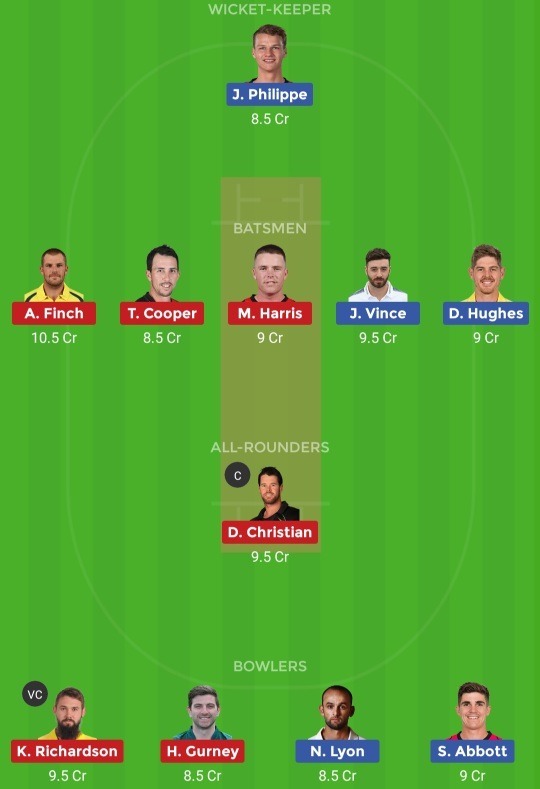 Aaron Finch (c), Marcus Harris, Sam Harper (wk), Tom Cooper, Cameron White, Dan Christian, Jack Wildermuth/M Harvey, Cameron Boyce, Kane Richardson, C Tremain, Harry Gurney. In wicket-keeper both J Philippe and S Harper are good. Captain and Vc choices: K Richardson, D Christian, A Finch, D Hughes, J Vince, S Harper. 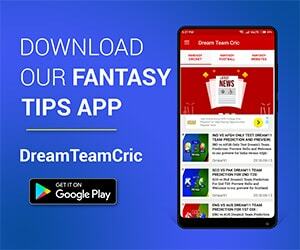 If you liked SDS vs MLR Dream 11 prediction, then follow us on Twitter for Latest Cricket News and Grand League Teams.